The 2015 Summer Adventures Camp and Activities Fair set for January 15 will provide attendees with the opportunity to explore camps, activities and local vendors and decide what will make for a fantastic summer. Pictured here, are attendees of last year’s fair. DOWNINGTOWN — Jump start your summer planning on Thursday, Jan. 15 with a night of food and fun at the Chester County Summer Adventures Camp and Activities Fair. The free event will take place from 5:30 until 7:30 p.m. at the Technical College High School (TCHS) Brandywine Campus, Entrance B, located at 443 Boot Road in Downingtown. The 2015 Summer Adventures Camp and Activities Fair will provide attendees with the opportunity to explore camps, activities and local vendors to decide what will make for a fantastic summer. 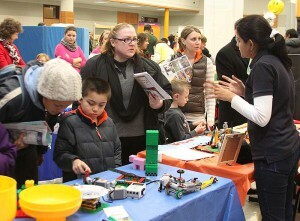 According to Jennifer Shealy, special events coordinator for the Chester County Intermediate Unit (CCIU), parents are encouraged to bring the whole family. Students from Kindergarten through grade 12 and their parents will be able to meet with representatives and gather information for a summer to remember. The Philadelphia Zoo, Longwood Gardens, Great Valley Nature Center, Power Play Rinks and School of Rock are just a few of those set to attend on January 15. Last year’s vendors included summer camps, summer schools, party venues, tutors, music and theatre, sports and exercise, arts and crafts vendors, outdoor camps and more. “It may be cold outside, but summer will be here before you know it. Now is a great time to check out the options that exist for children of all ages,” added Shealy. The Summer Adventures Camp and Activities Fair is organized and sponsored by CCIU. For more information, please visit www.cciu.org/SummerAdventures or contact Ashley Boyd at AshleyB@cciu.org.